New Zealand Media and Entertainment (abbreviated NZME and stylized as NZME.) is a New Zealand newspaper, radio, outdoor advertising and digital media business. It was launched in 2014 as the formal merger of the New Zealand division of APN News & Media and The Radio Network, part of the Australian Radio Network. It operates 32 newspapers, 8 radio networks and several websites in twenty-five markets across the country, and reaches over 3 million people. NZME brands include flagship national newspaper The New Zealand Herald, regional newspapers Bay of Plenty Times, Rotorua Daily Post and Northern Advocate, deals website GrabOne, and video on-demand service WatchMe. Its radio division operates radio networks Newstalk ZB, The Hits, ZM, Radio Sport, Radio Hauraki, Flava, Coast and Mix on radio frequencies around the country and through the iHeartRadio digital listening website and mobile app. The launch of the business fueled speculation APN News and Media could be planning to fully separate its New Zealand operations, or issue an initial public offering for up to 60 percent of its New Zealand assets on the NZX. Fairfax Media declined to confirm speculation in the Australian Financial Review that it could buy some or all of those assets. The publishing division of NZME reaches an estimated 2.1 million people each week by print, desktop computer and mobile. It includes national New Zealand Herald titles, six other daily newspapers, 23 non-daily newspapers and over 20 websites, mobile sites and apps. The New Zealand Herald is the flagship title of NZME and is the daily newspaper of Auckland. It has the largest circulation of any newspaper in New Zealand, peaking at over 200,000 copies in 2006, with numbers down to 162,181 by December 2012. Auckland is its main delivery area, but it is also delivered to much of the north of the North Island including Northland, Waikato and King Country. The Herald's publications include New Zealand Herald, Weekend Herald, Herald on Sunday and nzherald.co.nz. Its supplements include Bite on Monday, Travel on Tuesday, Viva, Driven and Herald Homes on Wednesday, TimeOut on Thursday, The Business on a Friday, Weekend and Canvas on Saturday, and Spy on Sunday. The launch of NZME has not affected home delivery of the paper. NZME publishes Northern Advocate and The Northland Age in Northland. It is the dominant print media outlet in the Bay of Plenty, where it publishes Bay of Plenty Times, Bay News, Katikati Advertiser, Te Puke Times, Coastal News and Waihi Leader. In Rotorua and Waikato it publishes Rotorua Daily Post, Hamilton News, Country News, Taupo Weekender and Turangi Chronicle. In Hawke's Bay it publishes Hawkes Bay Today, CHB Mail and Dannevirke Evening News. It also owns and operates Wanganui Chronicle in Wanganui. NZME Radio began as The Radio Network in 1996 when the commercial radio activities of Radio New Zealand were divested by the fourth National government as part of the Ruthanasia free market economic policies of that government. Radio New Zealand Commercial, which included talk networks Newstalk ZB and Radio Sport and music networks Classic Hits and ZM, became privately owned and was renamed The Radio Network. In 2014, it became part of NZME and was rebranded again as NZME Radio. The majority of the programming on stations is networked from the main studios on Graham Street in Auckland Central. However, Newstalk ZB run local programmes in Wellington and Christchurch, and The Hits runs local breakfast, morning or afternoon programmes. Auckland station Mix 98.2 was relaunched in 2014, based on stations previously known as Radio i, Easy Listening i, Viva and Easy Mix. Privately owned Gore station Hokonui Gold is operated by NZME under a long-term lease contract. Publicly owned Radio New Zealand Commercial became privately owned The Radio Network in 1996, and later that year it also purchased Prospect Media Limited and its eleven Auckland and Hamilton stations. The brands of Auckland's Radio Hauraki and Easy Listening i were retained and launched as nationwide networks, while Hamilton's Easy Listening i, Auckland's The Breeze on 91, Hamilton's The Breeze on 89.8 and the other stations were converted to the former Radio New Zealand brands. The company was bought out by a syndicate that included United States radio company Clear Channel Communications and publisher Wilson & Horton. Wilson & Horton was then purchased by Ireland-based media conglomerate Independent News & Media, and on-sold to Independent's Australian subsidiary APN. The Radio Network became an APN and Clear Channel networked commercial radio joint venture, like the Australian Radio Network already was, and as a result The Radio Network became part of the Australian Radio Network. Radio Network House in Christchurch was damaged in the February 2011 Christchurch earthquake beyond repair. 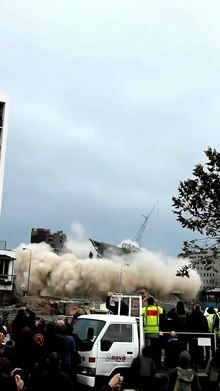 The building became infamous for being the first New Zealand demolition by implosion in August 2012. The implosion was conducted by US specialists and went without problems, providing reassurance for contractors planning to carry out similar operations. The Radio Network previously ran a group of provincial radio stations known as the Community Radio Network. Established in June 1998, the network retained the local names and live breakfast shows of each station but began broadcasting a network feed from Taupo for other times of the day. The line-up included Mark Bramley (10a - 2p), Aaron Gillions, Scott Armstrong and Brian Gentill (2p - 7p), and Peter Gosney, Corey K and Duncan Allen (7p - 12a). Other voices heard on the network included Geoff Bargas, Rebecca Ali, Nadine Christiansen, Sarah McMullan, Chris Auer, Marke Dickson and Paul Frost. On 1 December 2000 CRN stations joined the Classic Hits programme fed from Cook Street Auckland, also operated by TRN. Where the station had both an FM and AM frequency the FM frequency was usually used to broadcast a localised version of Classic Hits while the AM frequency was used to broadcast Newstalk ZB. Two stations, Radio Waitomo 1ZW and King Country Radio, have closed down. Others continue to operate as The Hits stations, including Tokoroa's Radio Forestland, Taupo's Lakeland FM, Gisborne's 2ZG, Masterton's Radio Wairarapa and Wanganui's River City FM. It also included South Island stations Radio Marlborough in Blenheim, Scenicland FM on the West Coast, 3ZE in Ashburton, Radio Caroline in Timaru and Radio Waitaki in Oamaru. In 2014, the entire Classic Hits network was rebranded as The Hits. Newstalk ZB and The Hits now reach 25 markets, and ZM and Radio Sport reach 19 markets. Radio Hauraki reaches 16, Coast reaches 12, and Flava reaches 8. ^ a b "APN to rebrand as NZME". New Zealand Herald. Retrieved 24 September 2014. ^ "Three into one as APN becomes NZME". New Zealand Herald. Retrieved 25 September 2014. ^ "Fairfax no comment on APN speculation". Stuff.co.nz. Retrieved 17 September 2014. ^ "APN News & Media considers NZ assets spin-off". Australian Financial Review. Retrieved 1 September 2014. ^ "ABC statistics". New Zealand Audit Bureau of Circulation. Retrieved 9 February 2013. ^ "NAB - New Zealand Herald". Newspaper Advertising Bureau. 2012. Archived from the original on 8 May 2012. Retrieved 23 May 2012. ^ "Radio Network House imploded". The Press. 5 August 2012. Archived from the original on 21 December 2012. Retrieved 6 August 2012. ^ "Radio Brands". Radio Bureau. Retrieved 15 October 2014.